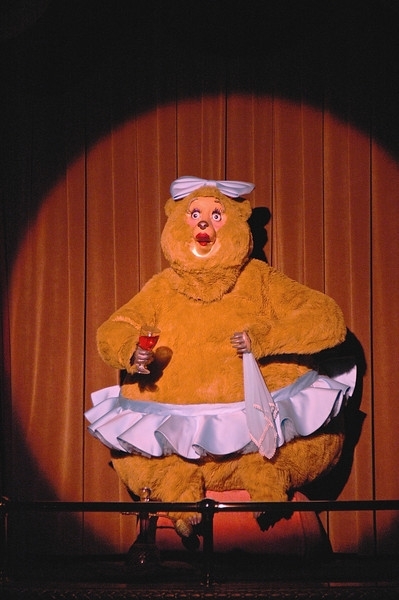 Trixie St. Claire from the Country Bear Jamboree! Adolph and Kimberly Timm was the first to send in the correct answer! Congratulations to Adolph and Kimberly and to all our winners this week! Aimee Tester, Al & Kerry Ganter, Andreas Beer, Andrew Carrieri, Axel Beer, Becky Hosinger, Belicia, Bob Hendrix, Bob Patterson, Bonnie Jean, Brian Richmond, Bruce Hinterleitner, Candy Yancey, Carla Nale, Caroline Burmester, casey lucas, Cathy Connors, Cheryl Costello, Chris Gretchen and Katie Barnes, Chris Malm, Christopher Hall, Claire Gregory, Cynthia, D Odaniel, Deb Ragno, Diane Curfman, Donald Purney, donna gibson, Doug Olson, Ed Suscreba, Edith LaBelle, Emily Hudson, Eric Enli, Erin Hammer, Frank & Sharon, Gary L. Strieter, George Mundy Jr, Gloria Martin, Gloria Martin, Grumpys Groupies, Herb Miller, Hillary Waldroop, Hunter Armstrong, Jacinda Seliger, Jackie Graebel, Jamie Poynton, Jamie Steiner, Jan Rosato, Jane Johnson, Janet Fosbender, Jay Tillis, Jeff Buller, Jeff Buller, Jeff Buller, Jennifer Masotti, Jessica Polizzotto, Jim & Lorie Sonnen, Jim Thompson, JoAnn Albrecht, Jodi Cook, Jodie S., Joseph M. Zafia, Josh Weiss, Julia and Carol Wickware, Julie B, Justin Fox, K Beasley, Karen Schlumpf, Kelly, Ken Conner, Ken Savage, Kerry A., Kerry Nichols, Kevin Bergin, Kris Nixon, Krista Connolly, Laurie Walker, Linda College, Linda Grau, Linda Hoffman, linda scrivano, Linda Wilham, Lori Rienhardt, Loring Family, Luis Rodriguez, Maddie Inman, Margaret Convery, Martha & Justin Collins, MaryAnn Eckenrode, MaryAnn Romagnano, matt cofone, Maureen and Warren Handy, Megan Krainski, Melissa Littman, Michelle Fure, Mike Haeberle, Mis Jamie Marie, Mylene Seward, Nan Amor, nicole ansert, Pam Simek, Patricia Morin, Patrick Broaddus, Patti McCaffrey, Patty, Pensacola Glenn, phyllis, Ray Kowatch, Rebecca Keenan, Rebecca Keenan, Richard Long, Robert P. Flaherty, Robert Wescovich, Ronnie Alvarado, Russ Morgan, Ruth Senecal, Ruth Woodhouse, Sandie Albrecht, Sandra Debow, SANDS FAMILY, Sandy Ceplecha, Sarah Kreps, Scott C., Serge, Sharla, Sharon Powell, Shelly Borella, Stacy Sanders, Sue and Ed Adams, Susan Masotti, Suzete Reinhart, Tammy Warmouth, Team Hill, Ted Flory, The Kertes Family, The Nufranick Family, The Rider Family, Theresa Maradei, theresa rucando, Timothy Johansen, Tom Higbee, Tom Koval, Toni Smith, Tracy Discher, Tricia Petty, Vera and Izzy Williams, Vicki Britt, Vincent DeGasperis, Weasemouse, and Wendy T Faler! Challenge #572 Where in the world is this? Do you know? Do you have a guess? Please send in your answer before the end of the day on Thursday, January 24th, by clicking on the blue box below.